Hello, I hope you've all had a lovely weekend! I think it's safe to say we all love things that smell good, from candles, to perfumes. I'm one of those people who will stand at a display of candles or perfumes and smell every single one, and I've also been known to ask complete strangers what perfume they're wearing because I love it so much. I've always had a lot of perfumes in my collection, and my first ever post on this blog three years ago was 'My Favourite Perfumes'. I think my first ever 'proper' perfume that wasn't one of those So...? perfumes was a Britney Spears perfume, the one that came in the round dark purple bottle, I loved it and looking back, I probably wore far too much of it! I used to love really fruity, girly scents and had pretty much every single Marc Jacobs perfume out there, but now I much prefer muskier fragrances. Perfumes are always such a hard thing to describe, but if you've ever smelt Tom Ford Black Orchid, Jo Malone's Pomegranate Noir or even Abercrombie Fierce, then those are the kind of fragrances I love. 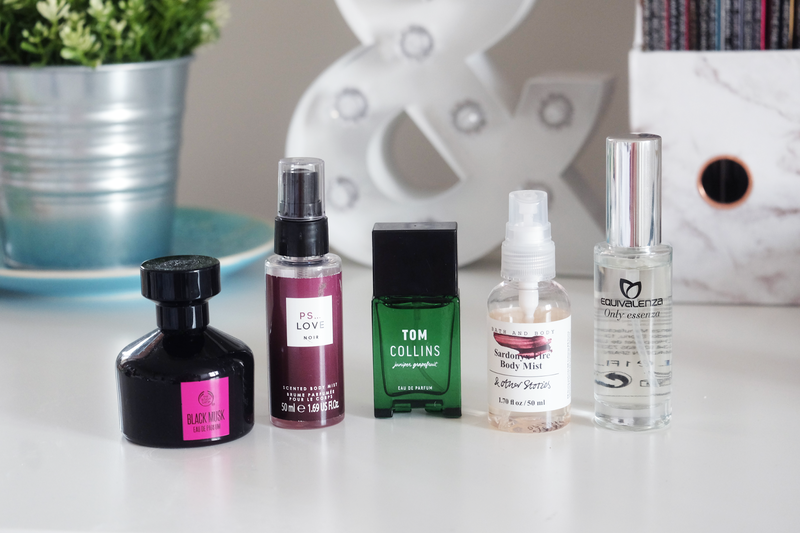 Today I wanted to share some of my favourite fragrances, and they all happen to be fairly inexpensive too which is always a plus! This has been my most favourite perfume for the last year or so. Sometimes I like to switch it up every now and again and use a different perfume for a change, but I always find myself going back to this. Now I'm not even going to attempt to describe how this smells, so instead, here's what The Body Shop themselves say about it, "This eau de parfum is our deepest, darkest, most sensual musk. The sweet notes of bambinella pear, pink pepper and bergamot are contrasted with the fierce black musk." I always carry a body spray in my bag, and I love little travel sized ones, so when I saw this spray in Penneys a few months ago, and tried it and realised it reminded me a lot of Pomegranate Noir, I bought three! They're only €2.50 so they're definitely worth picking up. Along with the body spray, on the same day I also saw a new range of perfumes in Penneys and I picked up them up in the Tom Collins and Dirty Martini scents. They're only €3.50 and have an amazing scent payoff (if that's even a thing) and again they're nice and travel friendly. Can you tell I love body sprays yet? I always get compliments when I wear this scent, and often people are surprised that it's not an actual perfume because it's smells so strong and sometimes body mists/sprays can kind of fade quite fast. I love & Other Stories' scents and the fact that they do a whole range of products in the same scent so I will definitely be picking up the Sardonyx Fire body scrub and lotion soon too. I think most people have heard of Equivalenza by now since they have a few stores in Dublin, but if you haven't heard of them, they're a perfume shop who specialise in finding the 'equivalent' to your favourite designer perfumes. The 237 perfume is almost identical to Jo Malone's Pomegranate Noir, so of course it's one of my favourite and I also love their 278 scent which is very like Abercrombie Fierce. The best part is that Equivalenza's perfumes are very inexpensive with a 100ml bottle only costing €29, more than half the price of the fragrances that they are almost identical to! What are your favourite perfumes? Are you as obsessed with body sprays as I am? Let me know in the comments, and thank you so much for reading!